Janie read New Power: How Power Works in Our Hyperconnected World—and How to make It Work For You by Jeremy Heimans and Henry Timms and found herself pondering how to be a good leader in this new power world. Allison Partners recently subscribed to The Next Big Idea Club, a book club with seasonal book recommendations curated by Dan Pink, Malcolm Gladwell, Adam Grant, and Susan Cain. 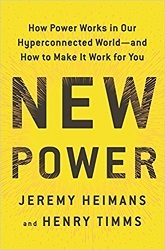 When we received our Spring books, I was excited to find New Power as one of the selections. The main premise of the book is that we used to live in a world of “old power” where society was primarily shaped by a handful of powerful people and that power was “like a currency—jealously guarded by each individual, and inaccessible outside the circles of the elite.” Our world is now more connected than ever before, and this has led to the rise of “new power.” New power “operates less like a currency and more like a current. It is peer-driven, participatory, and open to anyone, and it is strongest when it surges.” Across business, social, and political spheres, we can now see situations where the “old power” leadership style and the “new power” leadership style are at odds with each other. So, what does leadership look like in this new power world, and how can we harness the current of new power? Heimans and Timms argue that leaders need to cultivate a different set of skills to lead well in this new world: signaling, structuring, and shaping. Signaling is using speech, gestures, or actions to make a crowd feel more powerful and included. Structuring involves putting in place systems or practices that help enable and encourage the participation the leader is seeking. Shaping is setting the overall norms and direction of the crowd in ways that go beyond their actual authority. A great leader “uses their power in a way that creates more power for more people.” Heimans and Timms include many examples, both of leaders who are doing this well and of those who have done this poorly. I think my favorite successful example is the story of Ai-jen Poo, Director of the National Domestic Workers Alliance, who was awarded a MacArthur Fellowship Grant in 2014. During her acceptance speech, Poo said, “I couldn’t have done this without my colleagues. This is their award, too.” She and her team invested her $625,000 MacArthur grant (intended to facilitate Poo’s own creative growth) into the growth of the alliance’s workers instead. They established a fellowship to create development opportunities for their large community of nannies, housekeepers, and caregivers. Poo’s choice on how to use her grant and to honor a woman who came before her sent a very powerful message that it’s not just about her, it’s about the entire team. Her acceptance speech signaled inclusion, her collaboration with the team shaped norms around participation and value, and the fellowship and other programs that resulted helped structure involvement going forward. After I finished this book, I found myself reflecting about the different teams I have been a part of and the different leadership styles I have seen. I think the leaders who are effective in a new power world find a balance between leading their teams with vision and purpose and stepping back so that others can lead, too. Finding that right balance is really tricky; it can be easy to teeter too far in either direction. To me, the key is to do your best, own your failures when you have them, and try to lead by example whenever possible. What do you think?